Without seamless gutters, water will wash away the dirt and expose your foundation, allowing pests, moisture and possibly mold into your home. 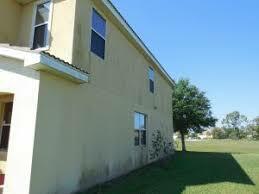 Allowing water to run off your roof without gutters will cause damage to your foundation. First the dirt and landscaping will be washed away. 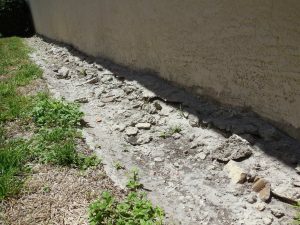 Next the moisture will cause expansion and contraction of the soils around your home, which is the number one contributing factor to slab foundation failure. After a period of rainy weather, the soils around a home become saturated with moisture and expand. As the soils dry, they shrink. With this repeating cycle, support to the foundation can be compromised, leading to cracked foundations and masonry walls. Rainwater cascading off a roof will impact the ground with enough force to cause a splash back. This splash back will contain dirt, grass and minerals that end up on the exterior of your home. Over a short period of time, a stain appears that can be difficult to remove or hide. Plants, flowers, mulch and soil located under edge of an unguttered roof will suffer from the water runoff even of a mild rainstorm. Additionally, this could permit harmful fungus to develop as well as attract ants, roaches and termites. A properly designed and installed gutter system keeps the soil surrounding your home at a consistent moisture level by directing roof runoff safely away from the house. Seamless gutters not only look great but they provide protection again common problems associated with sectional gutters. All our gutters are manufactured on site in seamless sections. The only seams are on corners. Unlike other companies, we install our seamless gutters with custom miters which not only looks good but has the best chance against future leaks. We provide a full 1 year warranty on installation that can be extended. We also offer a 20 year warranty on paint!